This is the quilt that really made me fall in love with quilting. 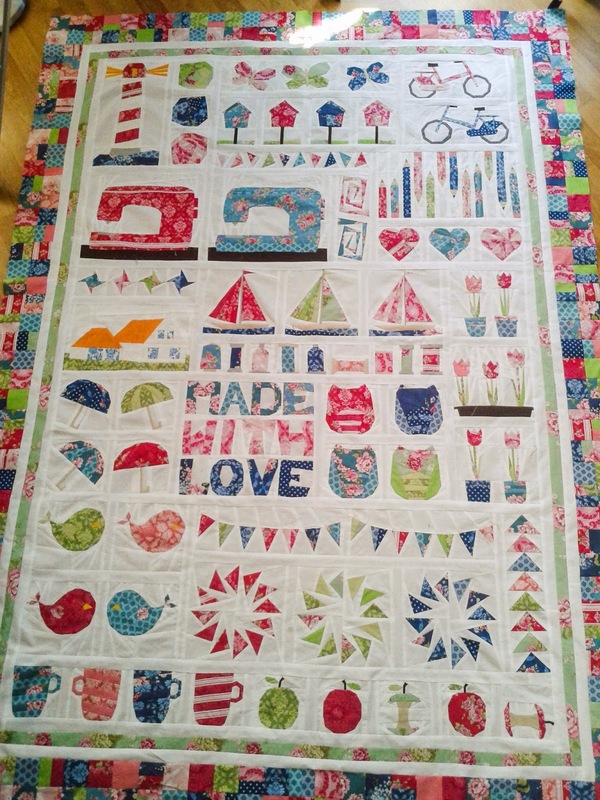 The quilt is called 'Things we love', I made it last year for my mom. The idea for this quilt came because my mom quilts a lot, but mostly for other people. So I wanted to make something, special just for her. The idea was to combine all things we love into one big quilt. "Things we love", made for my mom. Making the quilt was quite a challenge. I couldn't ask my mom for any advice on the process, since it was a surprise. 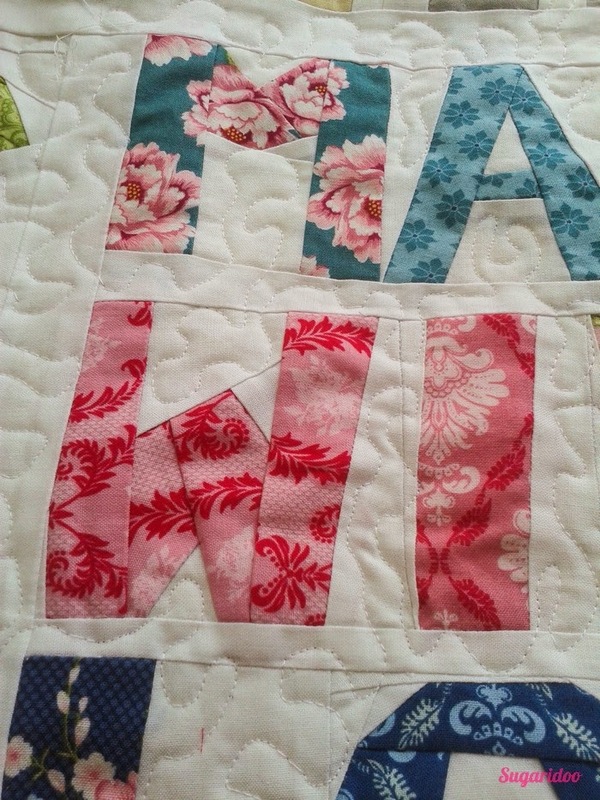 Also was it January '14 when I started, and I wanted to give the quilt as a present for her birthday, end of May '14. (Still wonder how I managed.) I would love to share the process of designing and making this quilt with you today. It started with drawing a layout. 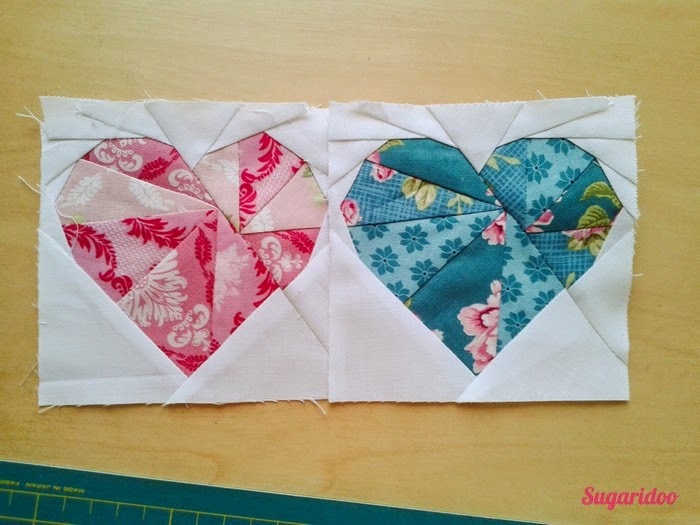 I decided to make paper pieced blocks in different sizes with 2.5cm sashing in between them. 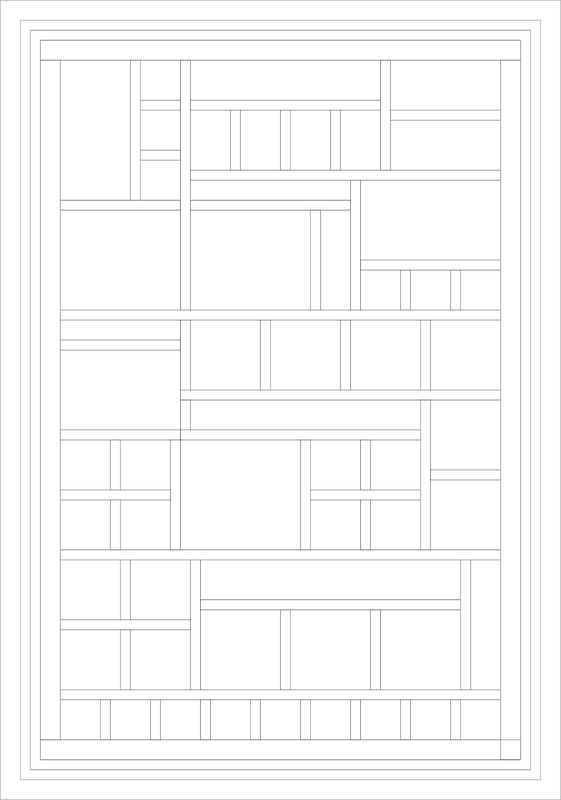 Because I didn't want all blocks to be just squared or all the same size, it was quite a puzzle to make the layout. After I had drawn the layout I started sketching ideas for the blocks. After sketching on paper I would make a straight line drawing on the computer for each block. Block for block I filled the layout until I had the design below. Fitting everything I wanted into blocks was the most difficult part of the design I think. It involved quite some moving blocks around, scaling, swapping places and adding and deleting blocks. Even when I finally started sewing I kept changing parts of the design. The layout and initial design for the quilt. 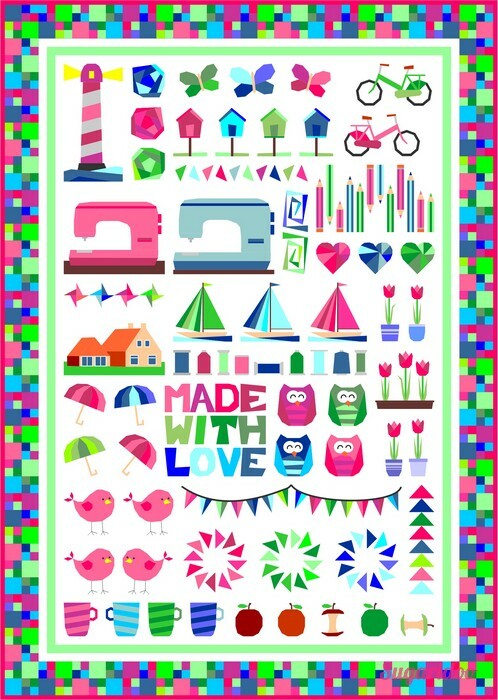 After the design above was finished, all blocks needed to be translated into paper piecing designs. So each block needed to be cut in 'sew-able' pieces. 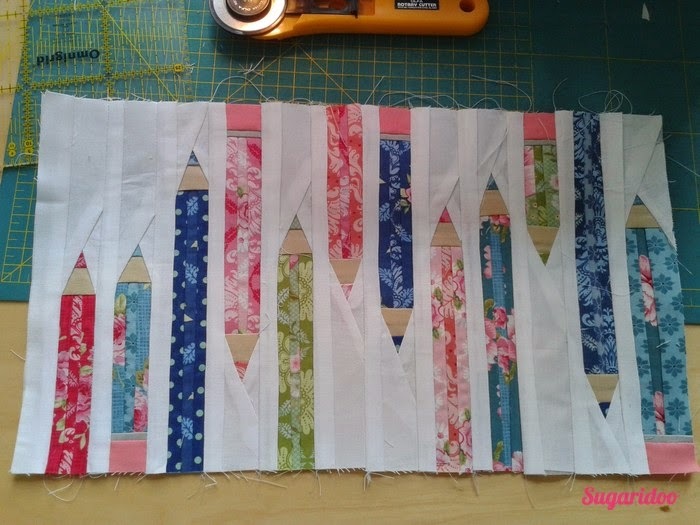 For me this was a fun thing to do, and felt like a big accomplishment for every block that was ready for sewing. Let me show you with the birdy block below. On the left the birdy as I drew is on the computer, in the middle I cut it up in pieces I thought would work for paper piecing and on the right the numbered pattern. Sometimes I would find out during sewing that the pattern wasn't working. Then I had to go back to changing the design and making a new pattern for it. While drawing the blocks, I needed to pick fabrics for the quilt. I found picking fabrics quite hard (I still find that difficult). So I went for the easy option of using fabrics from one designer, which would all go together nicely. I chose Tilda fabrics in different greens, turquoises, reds, pinks and blues and solid white for the sashings. So then, finally, the sewing could begin. 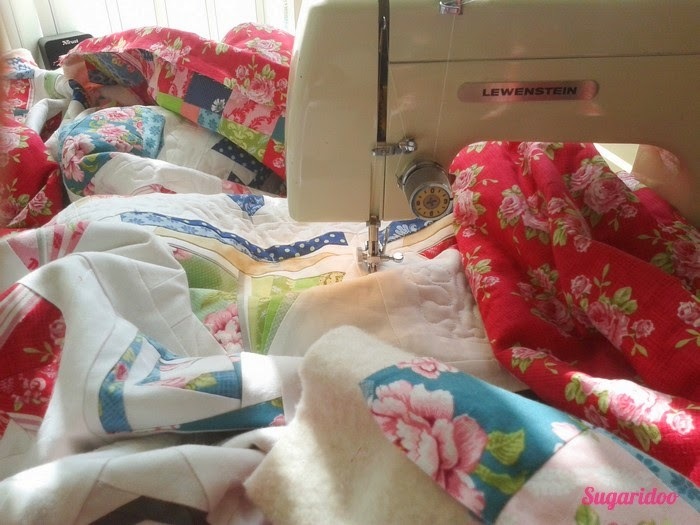 One night I would sit down and cut all pieces for a few blocks, and another day I would go to my sewing machine and sew all those blocks together. Alternating those tasks felt the most efficient, since I had only 6 months to complete the quilt (6 months, what was I thinking?) It was so lovely to see the blocks come to life in fabric! Let me show you some up close. Oh the borders, almost forgot. I got the idea for the small blocks somewhere on the internet. 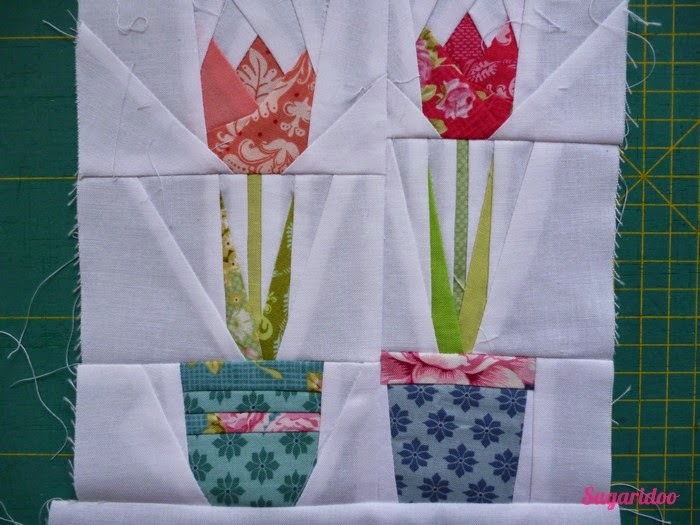 Such a clever way to use all the scraps in the a border! Since there was a lot of white in the quilt the colorful border worked really well I think. With the top finished, it way time to sandwich and quilt it.. So scary to put the quilt under the machine and just go for it! The idea was to quilt all the white spaced, so the figures would pop out more. Hand quilting isn't really my thing (and would really take to long), so I chose to do stippling free motion quilting. After watching some Lea Day movies on Youtube and practicing on small sandwiched pieces of fabric I just did it. My little machine and I had some tough moments, but as we went along it went better and better. Keeping in mind that my mom would probably still love it, even if the stippling wasn't perfect really helped. I am super happy that I just went for it. It seamed scary to free motion quilt on a small machine, but after some practice it's really no biggie. The best thing of all was just handing it to my mom. 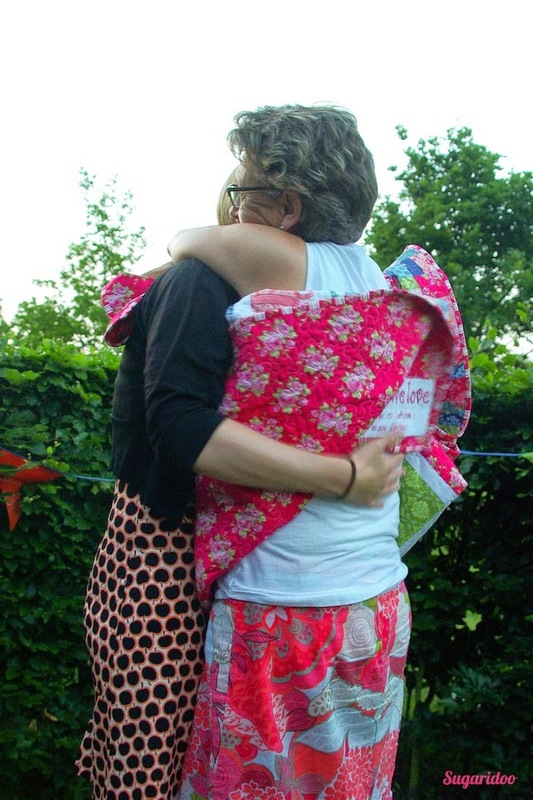 The beauty behind quilting for me is definitely making something with lots of love for the people you love. What is your most special quilt? And who did you make it for? 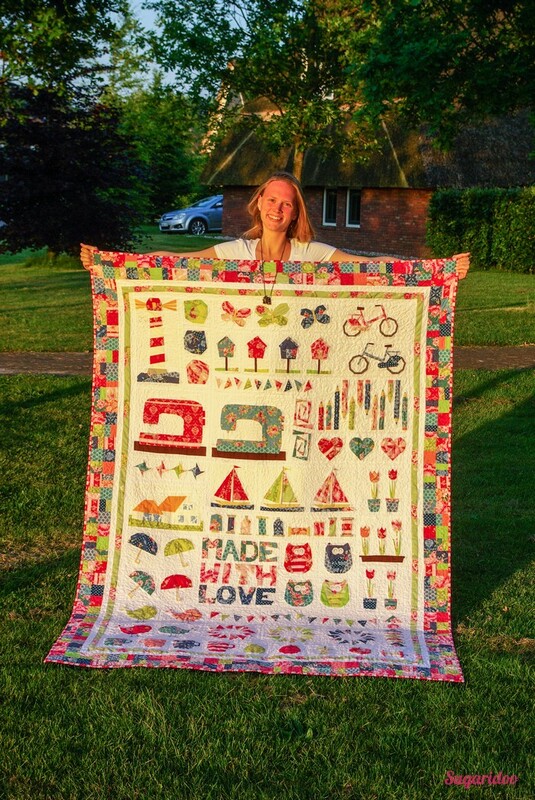 This is just a gorgeous quilt! I made a signature quilt for our first grandchild, with signatures from all four grandparents and seven great grandparents. It is a family treasure. Absolutely gorgeous quilt. Love this birds!